4,567,000,000 years ago, Earth was covered in molten lava. Earth was completely unrecognizable. In its earliest stage of formation, it was uninhabitable as it clumped from a cloud of dust. Since about 1,000,000,000 years ago, Earth had its first signs of life. Single-celled organisms consumed the sun’s energy. As a waste product, this cyanobacteria eventually filled the oceans and atmosphere with oxygen. Next, an oxygenated atmosphere paved the way for more complex life forms to exist. At about 100,000,000 years ago, dinosaurs roamed the Earth until their abrupt extinction. Finally, 10,000,000 years ago was the age of mammals. And these mammals are our direct ancestors. It was only 100,000 years ago when homo sapiens truly evolved. In this Earth timeline, we lay out all the pieces on the floor. What sequence of events have unfolded for Earth to support life and for it to evolve? The Big Bang created all matter in the universe. This includes the sun, planets and our solar system. At the center, the sun swept in smaller elements like hydrogen and helium. Farther away, heavier elements formed planets. Based on the core accretion model, gravity was the driver coalescing Earth from a cloud of dust. In this early stage of Earth’s creation, the heaviest material like iron sank to the core. Lighter material remained on top to form a crust. Because the solid inner core heats the outer liquid layer, it produces convection currents. This geodynamo is Earth’s magnetic field. Without it, Earth would be blasted by harmful rays from the sun. In the late Hadean Eon, the Earth was still in its late heavy bombardment stage. Earth was hit by asteroids, comets and foreign objects left, right and center. We know it wasn’t only Earth because we can see these impacts other places in our solar system. Some scientists believe that water originated from the bombardment of comets at this time. In addition, there’s reason to believe that these collisions could have sparked the chemical building blocks for life – DNA. One of the most important events for Earth was the formation of our moon. The giant impact hypothesis describes it as an object the size of Mars heading towards Earth at tremendous speed. After delivering a glancing blow to Earth, gravity pulls this object into orbit. Ever since this grande event in the Hadean Eon, it has remained in orbit ever since. The collision of the moon into Earth significantly impacted climate, oceans and life on Earth. Because the moon’s orbit drags Earth, it slowed Earth’s rotation significantly from 6 hour days to 24 hours. By having the moon in orbit, it also stabilized the Earth from wobbling. But most importantly, the collision of the moon tilted Earth on its axis. And because the Earth is tilted on its axis, Earth now had seasons. Eventually, the climate on Earth became more stable in the Archean Eon. Instead of a molten state, the Earth started to cool down. Water vapor condensed to form oceans. And the Earth cooled down enough to create continents. Though opinions vary, “Vaalbara” became Earth’s first supercontinent. As the Earth cooled down, a new form of life began to prosper. When oxygen was absent in the atmosphere, cyanobacteria could convert sunlight to energy. In shallow water, they metabolized their own food. As a waste product, cyanobacteria released oxygen into the oceans. When oxygen mixed with iron in the oceans, rusted iron collected on the seafloor. The banded iron formation continued until there was no more iron in the oceans to rust. Oxygen had nowhere to go but into the atmosphere. That’s why this event is the Great Oxygenation Event. Earth now had an oxygenated atmosphere for new life to flourish on Earth. But it wasn’t cyanobacteria flourishing. Because oxygen was toxic for cyanobacteria, they poisoned all anaerobic life on Earth including themselves. Imagine a dominant species polluting the planet until extinction. The oxygen byproduct from cyanobacteria created an oxygen crisis on Earth. At this time, methane was more abundant in the atmosphere. One thing that methane did very well was trap heat in the atmosphere. It’s one of the most efficient greenhouse gases there are. So when oxygen combined with methane, it produced carbon dioxide. All of a sudden, the greenhouse effect wasn’t as strong. As a result, the whole planet froze. It was “Snowball Earth” as the Earth went into an ice age for the next 300,000,000 years. Another important consequence of an oxygen-filled atmosphere was the emergence of aerobic eukaryotes. Before oxygenation, life was anaerobic. Eventually, aerobic respiration organisms emerged because of the enriched atmosphere. This increased the complexity of life. For example, multi-cellular organisms became apparent in this eon. But the abundance of CO2 held eukaryotes from diversifying. As oxygen filled the atmosphere, Earth’s ozone layer thickened. Before the presence of an ozone layer, life was restricted to shallow water. Because water shielded harmful radiation, that’s where life existed. 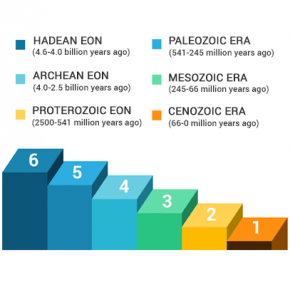 Eventually, a thicker ozone layer (O3) enabled life to diversify on land in the Proterozoic Eon. The Cambrian explosion was the largest diversification of life in Earth’s history. Everything before this era was precambrian. We couldn’t identify life because we didn’t have fossilized shells or animals. This is when hard-shelled invertebrates originated in the oceans. The Cambrian explosion started with the Age of Invertebrates. And life got more diverse from there. Next came the Age of Fish when thousands of fish species arose. Then, the first vertebrate land animal made its leap ashore. Amphibians took a breath of fresh air and colonized the empty continent of Gondwana. This was the start of the Age of Amphibians. We share similar characteristics as our vertebrate ancestors. For example, humans have spines, jaws and mouths originating from fish. In the Paleozoic Era, lush rainforests flourished on land. But due to an abrupt shift in global warming, a major marine and terrestrial extinction event began. This event was the Carboniferous Rainforest Collapse. Plants and swamps were buried, compacted and cooked into underground coal deposits. It left behind vast deserts for reptiles to eventually dominate the continental interior. The Paleozoic Era ended with the largest extinction in Earth’s history. The Permian-Triassic Extinction vanquished 96% of all marine species. About 70% of terrestrial vertebrate species were wiped out. Opinions vary about the Permian-Triassic Extinction cause. But the consensus is that it was from a major asteroid impact event. When Earth’s climate became hotter and drier, rainforests collapsed triggering the Age of Reptiles. Reptiles are different from amphibians because they lay their hard-shelled eggs on land. They essentially adapted to the land by cutting all ties with the ocean. Because reptiles evolved to dryland conditions, they gained a unique ecological advantage. As conditions changed, dinosaurs (also known as terrible lizards) began to evolve. These reptile-like mammals had scaly skin and hatched eggs like reptiles. Some dinosaurs adapted as herbivores and some as carnivores. For the next 160 million years, dinosaurs were the dominant land vertebrates on Earth. The Age of Conifers in the Mesozoic Era provided the spread of seeded plants. Conifers store vast amounts of carbon. As a result, oxygen content in the atmosphere jumped to 35% compared to 21% today. In addition, they provided habitat, shelter and a source of food for specific animal species to survive. Also notable is that Pangea existed as one supercontinent in this era. Dinosaurs lived on one supercontinent. Plate tectonics were the mechanism that eventually tore continents apart. Don’t forget that dinosaurs existed for 160 million years. So continental drift gradually rifted dinosaurs apart. We know this because we can find the same fossils on separate continents. Ultimately, the start of the Cenozoic Era was the demise of dinosaurs. After a 6-mile wide asteroid hit Earth, a dust cloud blocked the sun. This caused temperatures to plummet which was the heart of the damage from the Cretaceous–Paleogene extinction event. Because of the worldwide climate disruption, it was responsible for the extinction of the dinosaurs. Mammals existed long before the Cenozoic Era. But they kept a low profile because dinosaurs dominated the land. After the extinction of the dinosaurs, this marked the Age of Mammals. When dinosaurs roamed the Earth, mammals remained small and fury. And because dinosaurs went extinct, mammals emerged as the largest land animals at this time. Apes remained in trees for their primary food source. Eventually, grass began to spread in places like the African Savannah and there were fewer trees. This forced apes to walk to new food sources. With their heads above the grass to see predators, apes evolved by walking on two legs. It also helped to have their hands available when they were traveling. As the timeline to modern human evolution begins, hominids were the early proto-humans. They were known for sharpening objects with silicon rocks. They began to master the use of their hands and fingers. In the stone age, early humans had fire under control. This enabled them to cook their food giving them more calories. Modern humans learned to make more complex sounds and share information in groups. 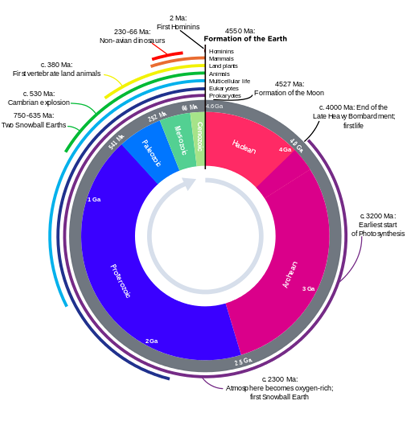 So humans have only existed for about 0.004% of the age of the Earth. It’s almost unimaginable the story of Earth. It spans over 4.5 billion years. Scientists are still fitting all the pieces to the puzzle. Since its creation, oceans, continents and life as we know it have remarkably transformed. Life has evolved and adapted. Though opinions vary, we’ve leaped through 4.5 billion years of Earth’s history and provided a general guideline. What are some important events we missed? Let us know below. Very Helpful for my class project! Thank you so much! Great synopsis and very helpful to my home-schooled children. I would suggest a modification to the presentation of the giant impact hypothesis. The hypothesis promotes that Mars-sized body, known as Theia, collided with Earth, throwing vaporized chunks of the earth’s crust into space (as opposed to delivering a glancing blow, implying that Theia survived and is now the moon). Gravity bound the ejected particles together, creating the moon. The idea is supported by the similarities in composition of earth and moon matter. Thank you. Hi, nice write up, however, I noticed the color coding of the bar graph and the corresponding era isn’t matching at the very top of the page. In a PBS video it said that Pangea had formed during the Paleozoic, not the Mesozoic.